These two ships, which are based at NASA's Kennedy Space Center in Florida, sail out to find and recover the Shuttle's two solid rocket boosters (SRBs) after each launch. While those huge white rockets provide most of the thrust for the shuttle's initial ascent, they separate from the craft about 75 seconds after liftoff, falling back to Earth and splashing into the Atlantic Ocean on enormous parachutes. Getting the SRBs back to shore is no small feat. Each one is 150 feet long and 12 feet wide, and weighs roughly 200,000 pounds---that's after it's done burning through nearly one million pounds of solid rocket fuel. So how does NASA recover them? Right now, 50 engineers and technicians at Fukushima are risking their lives to avoid a meltdown of crippled nuclear reactors at the plant. It's already the worst nuclear accident since Chernobyl, and the fact that this happened in Japan, a nation that's historically well-prepared for major natural disasters, made us wonder about our own nuclear plants in the U.S. How would they fare in the event of a quake or tsunami? And how do they train their operators to handle the wide range of emergencies that could pop up? To find out, I drove down to Plymouth, MA, to talk to the training staff at Pilgrim Nuclear Generating Station. 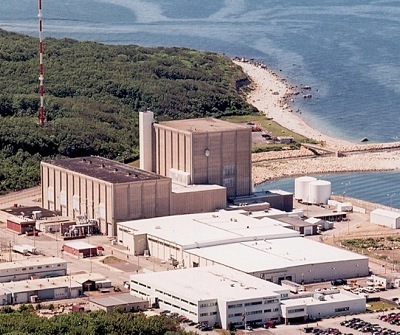 Pilgrim is only an hour south of our offices in Boston, and it's one of 23 stations in the U.S. that use a similar reactor design as the Fukushimi Daiichi plant: a G.E. Boiling Water reactor with Mark I containment (the protective metal structure surrounding the core). This ominous connection to the crippled plant in Fukushima is not lost on residents of the Boston area. Local TV, radio, and print journalists have been covering the plant extensively over the last few weeks, and have raised a number of questions about the plant's margin of safety. Continue reading Behind the Scenes: Inside a Nuclear Control Room. Hi all -- Today I'm posting for guest blogger Rhitu Chatterjee, Science Reporter for PRI's The World radio program. With Rhitu's help, The World is starting a special partnership with NOVA to share science content, so you'll be hearing much more from her in the future. In the meantime, you can listen to her work on The World's science podcast. On August 12, Science reported the discovery of a new pulsar in deep space. The find is exciting, but how it was found is arguably just as compelling. First, the discovery. I won't bore you with the pulsar's name -- it's dry, numerical, and hard to remember. Suffice it to say it's a rare kind of pulsar that is located some 17,000 light-years from our planet. Pulsars are a kind of neutron star, formed when the core of a giant star collapses after a supernova. 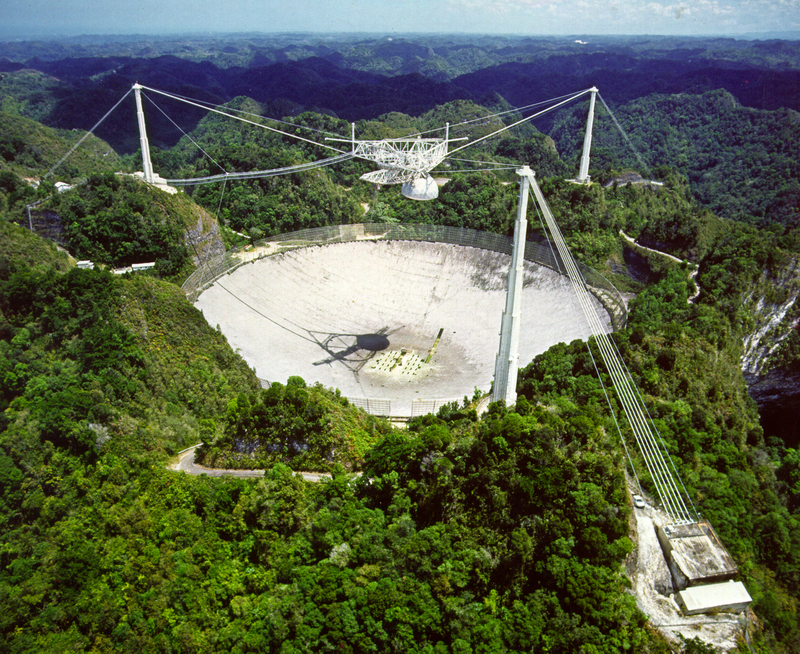 They are dense and emit pulses of radio waves, sort of like a lighthouse beacon in space. 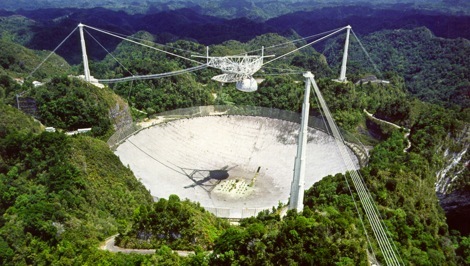 Evidence for the pulsar lay hidden in data collected by the Arecibo radio observatory in Puerto Rico. "Pulsars are some of the coolest objects in astronomy," says study leader Bruce Allen, who directs the Max Planck Institute for Gravitational Physics in Hannover, Germany. Allen was more than happy to talk about the discovery, but he was equally animated talking about how it came about. Continue reading New Pulsar Discovered--By Volunteers. NASA may not be an agency known for its commitment to aesthetic filmmaking, but they've managed to produce one of the most beautiful clips of footage I've watched in years. The film below is a space shuttle launch from the perspective of a solid rocket booster, one of the giant white rockets attached to the belly of the shuttle during its ascent. Thanks to a tiny camera and contact microphone attached its frame, you can ride along with it as it sends the shuttle into orbit, then free falls back to earth. There's not much going on visually until the boosters separate at about the two-minute mark--but after that, it's a film even Stanley Kubrick would be proud of. This clip was shot during STS-124, a mission flown by the shuttle Discovery to deliver a new Japanese module to the International Space Station. Got a favorite science-related video? Send it our way! Just comment with a link below. From Texas to South Dakota, the great plains of the central U.S. are home to countless tornadoes each year. The worst of these storms can level entire towns, leaving nothing but concrete foundations in their wake. But despite their devastating power, tornadoes are not well understood, says geophysicist Roger Wakimoto from the National Center for Atmospheric Research (NCAR). "It's embarrassing," he says, "but we still do not understand what triggers tornado genesis." That's why Wakimoto and a team of experts from around the country organized VORTEX2, one of the largest field studies of tornado weather ever attempted. With more than 140 scientists and 35 research vehicles, it's a mobile armada, equipped with doppler radar trucks, car-mounted weather stations, and dozens of deployable instruments that can be placed in a twister's path. I recently had the opportunity to follow the VORTEX2 team during the final days of their six-week expedition. When we met up in a tiny crossroads town in eastern Colorado, they had already been on the road for five weeks, rarely sleeping in the same town for more than one night. It was a grueling schedule. But Wakimoto says that staying mobile is necessary in order to see potential tornadoes as they form. Continue reading Chasing Twisters with VORTEX2. Think you had it bad when your 8-track collection went the way of the dinosaurs? If your media has become obsolete, it might be an inconvenience in your life--but at worst, you've probably only lost the ability to watch your copy of Footloose (hey, I won't judge). In the world of science, though, obsolete media can sometimes mean the loss of irreplaceable data. That's a problem NASA has run into in the past. In the mid-1960s, it stored information from five lunar orbiter missions onto miles of analog tape, which was state-of-the-art for the time, but pretty quaint by today's standards. Still, even with woefully underpowered computers, they were able to create detailed maps of the lunar surface, and pinpoint exact landing sites for the upcoming Apollo 11 mission. When that mission was over, though, the tapes were largely forgotten. They collected dust in an archive for more than 40 years, and the refrigerator-sized machines that could read them were slowly sold off or destroyed. Today, an engineer named Dennis Wingo is working to resurrect that data. He co-leads the Lunar Orbiter Image Recovery Project--which, as the name implies, is working to pry all that old data off of the tapes. So far, he's been successful, thanks to a combination of skill and pure luck. Wingo's team located one of the only NASA computer tape drives left in existence, and carefully restored it to its former glory in order to digitize the old tapes onto modern hard drives. Wingo is also using his data recovery skills on tapes from NASA's NIMBUS satellites, which recorded the temperature of the Earth's surface in the mid-60s using infra-red sensors. In the process, they yielded an extensive data set spanning the entire globe, capturing a snapshot of hurricane season, ocean currents, even the extent of arctic and antarctic ice. it's information that could be invaluable for climate change research. Wingo thinks there's an important lesson in all this. Although the march of technology will (almost) always move forward, we shouldn't forget the machines of the past. Because as NASA's forgotten tapes have shown, they've still got some important things to say. (Above: the iconic "Earthrise" image--the first ever taken of the Earth from the Moon's perspective. 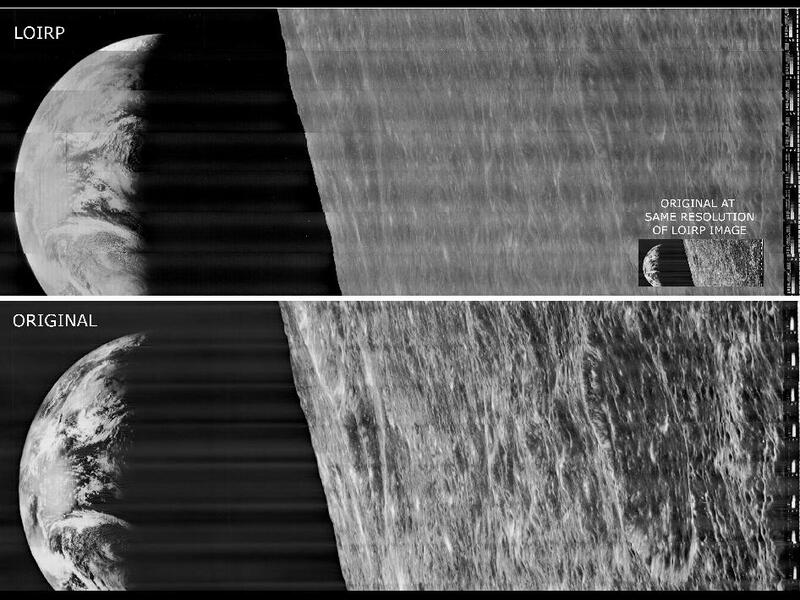 The original image as seen in 1966 appears on the bottom; Dennis Wingo's re-scanned copy is at the top). You can hear a recent podcast we did with Dennis Wingo here. 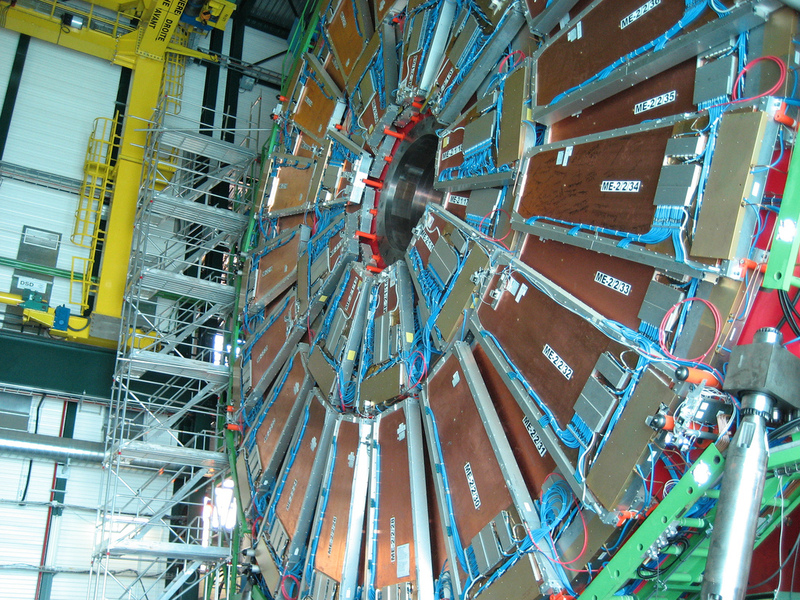 The LHC: Up and Running At Last! Today is a huge day for physics. As of this afternoon, the Large Hadron Collider (LHC), the world's biggest and most powerful physics experiment, is finally up and running. It's been 16 years and over 10 billion dollars in the making. 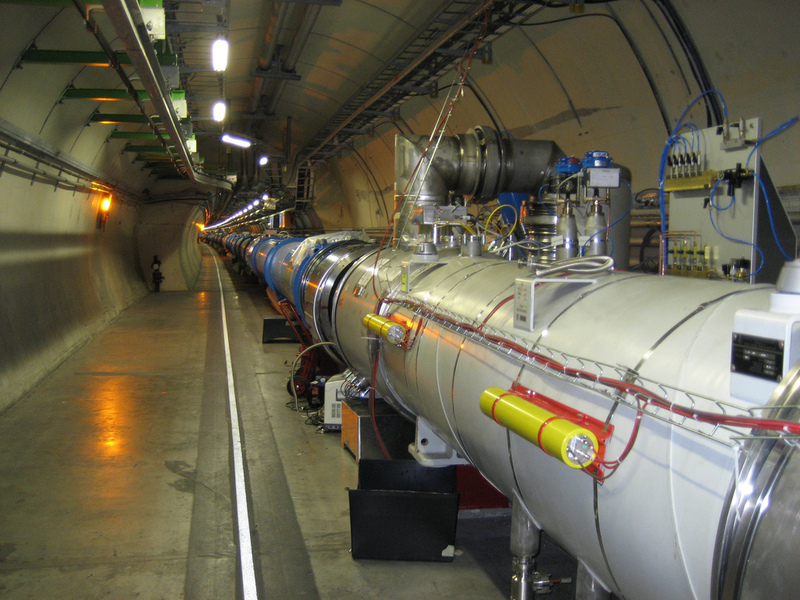 Although the LHC was slated to go online in 2008, an explosion in its 17-mile tunnel brought the machine to a grinding halt. Even now, it's only operating at half power (full-power won't come until 2013), but it's already setting records. Eventually, the LHC will smash protons together at forces that simulate the first trillionth of a second after the big bang, which will offer physicists a new window into the formation of the universe. 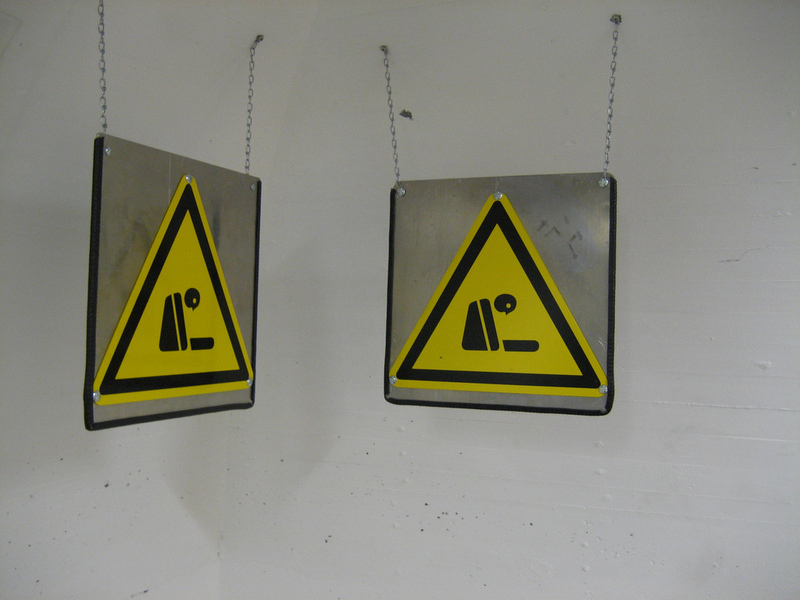 In 2007, I had the opportunity to visit the LHC when it still under construction. It was a mind-boggling experience. More than 300 feet under a Geneva suburb is what looks like an endless tunnel stretching for miles, broken in a few spots by cathedral-sized caverns packed with sensitive detectors to measure the collisions of sub-atomic particles. All in all, it felt like visiting the Death Star. To give you a "behind the scenes" look. I've posted a few photos from my trip below. 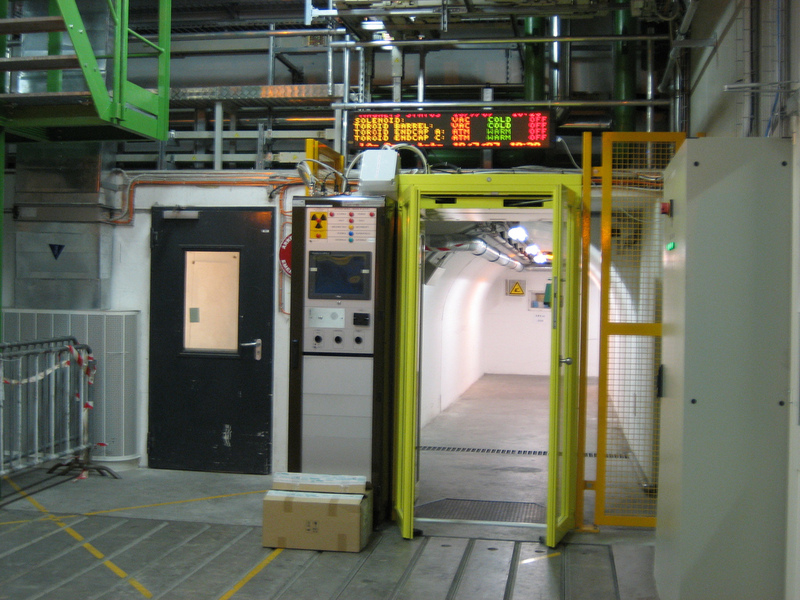 (above, left) the security entrance to the ATLAS detector at the LHC. This is at the bottom of a 300-foot elevator shaft--and although its name suggests it's there to keep people out, it's really to help keep track of who's already inside. Because if there's a liquid helium leak in the tunnels, you'll look like the guy on the sign (right) in no time.. As my guide reminded me, ALWAYS carry your emergency breathing equipment. 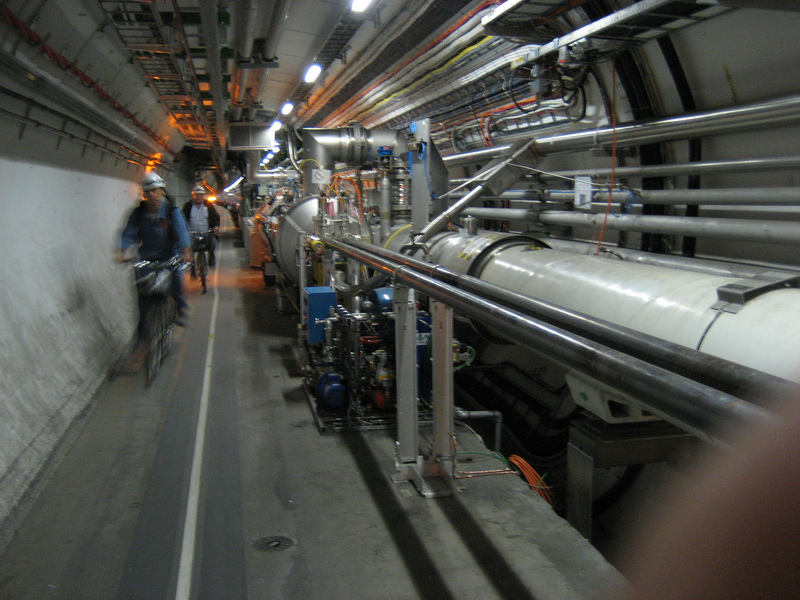 The underground tunnels of the LHC stretch for 17 miles--a distance which physicists and technicians often travel by bike (left). The white tube sections to the right side of both images house the LHC's beam pipes, where protons are suspended in a magnetic field and pushed to 99% the speed of light before being smashed together in huge detector chambers. 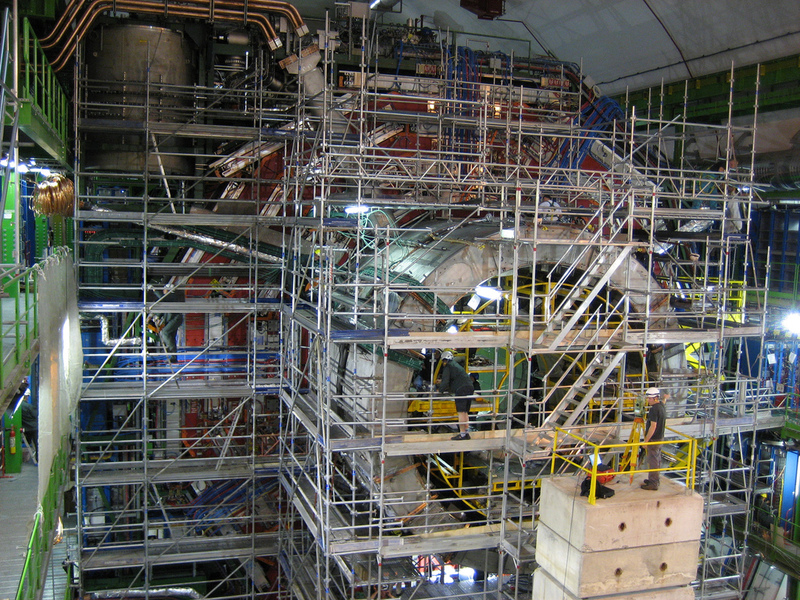 The Compact Muon Solenoid (CMS) detector under construction. This complex device will sense collisions between subatomic particles called Muons. The metal staircase to the left of the image (top left) gives a sense of scale. Likewise, take a closer look at the shot to the right, and you'll see two technicians surveying the underground chamber that the CMS detector sits in. For an in-depth look at the LHC and its role in the physics community, check out the web features we produced for NOVA scienceNOW back in 2007. You can listen to expert audio, view video clips of the segment, and get more info on this amazing machine. When I first met Brendan Foley last fall, I was immediately struck by the scope of his ideas. He's the resident archeologist at the Woods Hole Oceanographic Institution (there's only one), and he studies ancient shipwrecks in the Mediterranean. But Foley's style of archeology is very different from traditional forms. Instead of spending years excavating a single site, he wants to take a big picture approach, using tiny robotic vehicles to quickly find and catalog as many ancient wrecks as possible--gathering useful data about the size, shape, and contents of each vessel without ever touching them. In the ancient world, Foley says, sailing ships were the vector for the exchange of goods, food, and even ideas between ancient cultures. "Sailing was safe, but not perfectly safe," he says. "A small percentage of all sailing voyages end in wrecking events. What we're left with, then, on the bottom of the Mediterranean, is a random sampling of everything that ever moved across the Mediterranean throughout antiquity. Really, the entirety of the human experience lies there on the sea floor." Foley thinks that by collecting basic information on a vast number of wreck sites, he can start filling in gaps in our understanding of the very early days of western civilization. His ultimate goal is an ambitious one--to document and compare every known wreck in the Mediterranean. Right now, he's doing it one site at a time. But as the technology of autonomous underwater vehicles improves, he thinks it might be possible one day to conduct the survey remotely using a fleet of small robot submarines. Of course, that's years away from being a possibility. But who knows? if technology catches up to his vision, Foley's work could provide new insights on the origins of western civilization. If you've been to the NOVA website, you may have seen some of our audio features like "E = mc2 Explained", or "Defining Science". Or maybe you already subscribe to our podcasts (which I highly recommend, and not just because I produce them). Well, this week, we're trying something new in the audio realm. NOVA is dipping into its archives for a collaboration with WGBH radio. The result is the "NOVA minute"--a series of short clips from scientist interviews that we think are especially interesting, timely, poignant, or just fun. They're small and satisfying--kind of like science hors d'oeuvres. Want to hear pieces like these in your town? Have a suggestion for what NOVA should do on the radio? Tell us what you think!